Earlier this year, Annelies at Attune Foods generously asked me if I would like to sample some of Erewhon’s Gluten-Free cereal products. My family loves cereal for breakfast. Although we don’t eat cereal very often anymore, it is always a special treat when we do. I jumped at the opportunity to try out the cereal. When the cereal boxes arrived at our door, my daughter was delighted. She immediately asked if she could have a bowl of cereal as her afternoon snack. My entire family sampled each box of cereal over the next few days. Erewhon cereals are made up of natural, organic ingredients and never contain GMO ingredients. No artificial colors/flavors or synthetic additives/preservatives are ever used. The cereals have all been tested at an independent lab to verify they are free of gluten. The Crispy Brown Rice cereal is indeed crispy and stays crunchy after adding milk to it. I particularly like this cereal because it has less than 1 gram of sugar per cup. The Crispy Brown Rice with Mixed Berries cereal contains freeze dried blueberries, raspberries and strawberries. It is delicious and quite tasty. I only wish that it contained a few more berries. I added a banana to this cereal to make sure I was eating a full serving of fruit for breakfast. Rice Twice was my favorite cereal of the three (same for the rest of my family). It is slightly sweet and very crispy. I found it to have the most flavor of the three cereals and to be quite addicting! 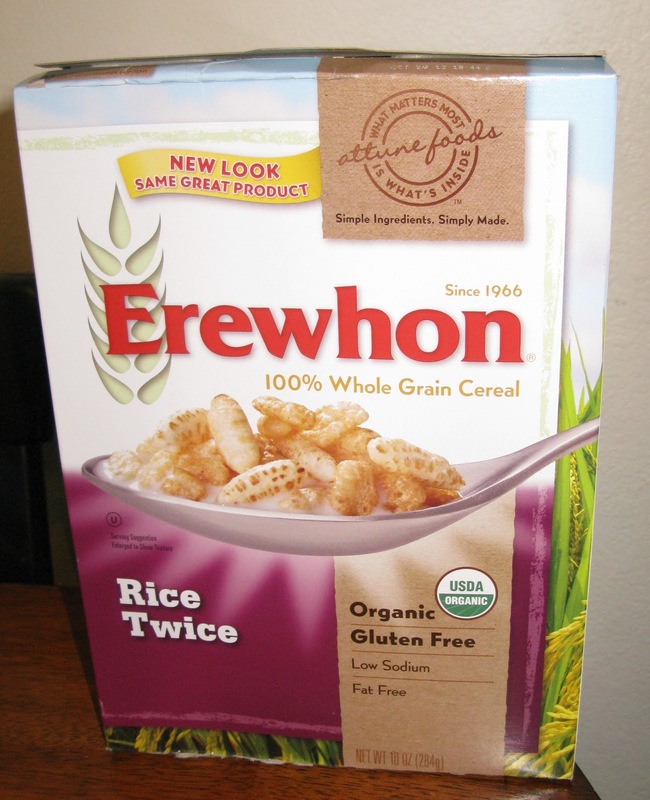 Erewhon cereals can be purchased online or at most grocery stores across the country. I recently saw these cereals at my local grocery store for $3 per box. 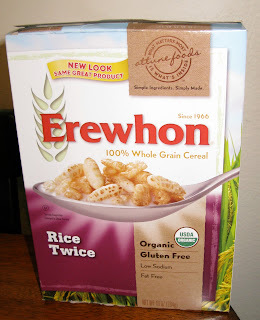 Erewhon is now one of my favorite gluten-free cereal brands. I highly recommend you check them out! 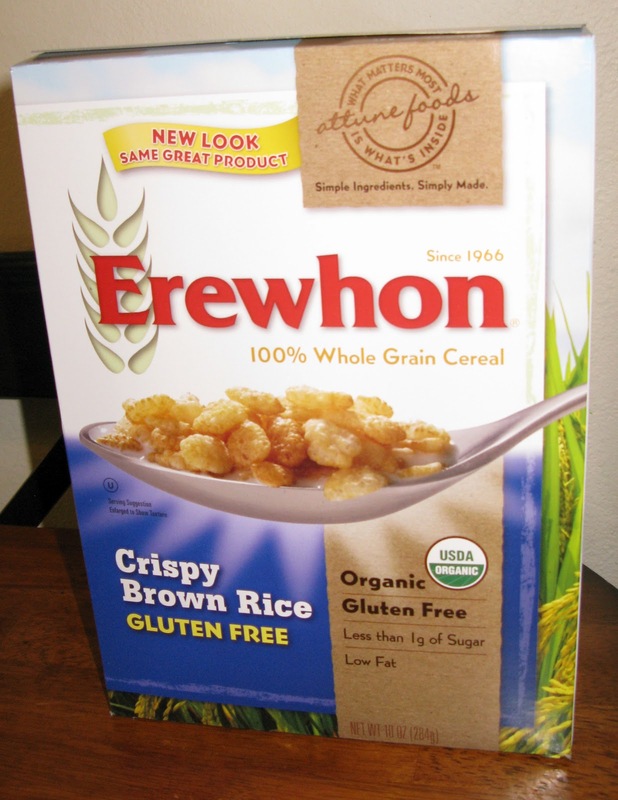 One lucky winner of this giveaway will receive free boxes of the Erewhon Gluten-Free cereals of their choice. This giveaway is only open to U.S. residents. To enter this giveaway, please leave me a comment letting me know what is your favorite breakfast food. – Like me on Facebook, then leave me a comment letting me know that you did (if you are already a “liker”, then leave me a message informing me). – Follow me on Twitter and leave me a comment letting me know that you did (or let me know that you are already a Twitter follower). – Become an email subscriber and leave a comment telling me you signed up. -Become a follower of my blog. This giveaway will close on Tuesday, February 14th at midnight. The winner will be selected from random.org and announced next week. Good luck! Favorite breakfast cereal? Hmm, actually I use breakfast cereal in my yogurt or for baking. Right now I'm on a peanut butter cheerio's kick. I do like brown rice cereal though, it's perfect for granola, raw cookie dough balls and rice krispie treats!! My favorite breakfast food was eggs on toast or cereal with banana when I ate more grains in my diet. However, the rest of my family eats cereal almost daily. does rss feed count? LOL! If you let me know you are part of the RSS Feed, I'll count it as an entry too. Thanks Maureen! I just signed up to get your emails. Thank you there are some great recipes and information on this site. My favorite breakfast food is gluten-free muffins. What a fun giveaway! I'm going to share on FB! My favorite breakfast food is cinnamon toast with lots of butter! signed up for email updates, thanks! My favorite breakfast food is scrambled eggs with toast. I like granola for breakfast. I enjoy oatmeal with fresh blueberries!